After seeing the combination of Kachoris and Aloor Dum ( popular Bengali dish ) in many blogs, I had wanted to try it, but kept putting it off for one reason or the other. And then, last week , I saw these kachoris with aloor dum in a cooking show, and I couldn't wait any longer to try it. I made Radhaballabhi kachoris ( obviously my next post ) along with Aloor Dum, though I made it as an evening snack, we can have this for a weekend breakfast or brunch. I already have a post for Dum Aloo in my blog, a very rich almond-yogurt based curry, but this one is a very simple dish, but very tasty in its own way and a perfect side dish for the kachoris. 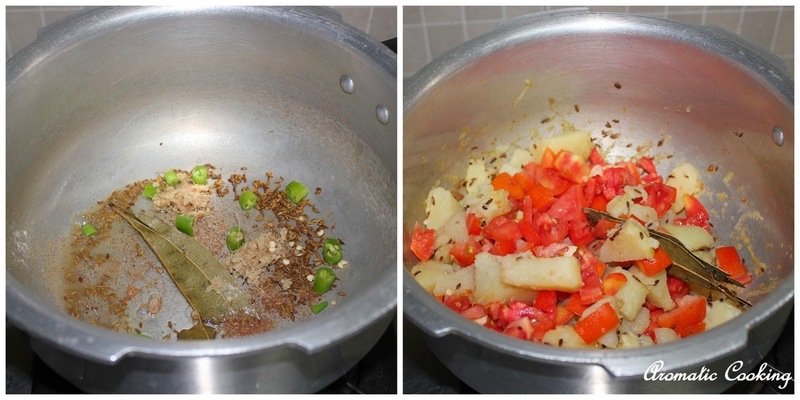 We just loved this curry and it would go very well even with regular pooris and rotis too..
Heat some oil, add the bay leaf and the cumin seeds, when it starts sizzling, add the asafoetida, green chilly and ginger and saute for a few seconds, then add the potatoes and tomatoes and mix. Add the salt, turmeric, chilly and coriander powders along with about 2 cups of water, bring it to a boil and let it simmer for about 5 to 7 mins. Finally, add the sugar, mix, garnish with the chopped coriander, remove and serve with kachoris, pooris or rotis. 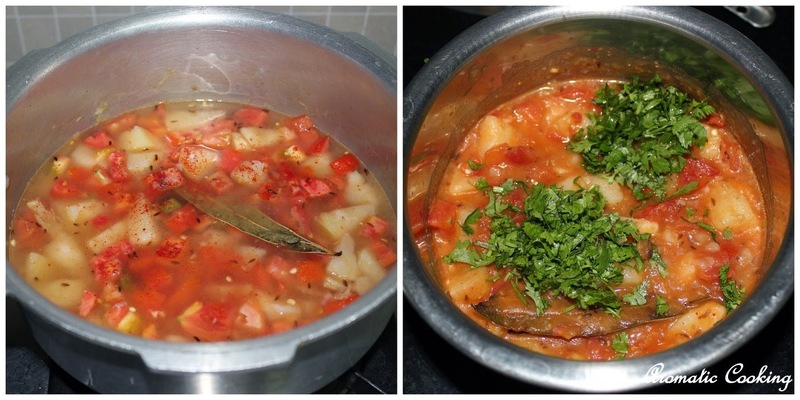 Use tomatoes that are not too sour. The original recipe didn't have red chilly powder and coriander powder, but I added it for more flavor and also, because I felt that one green chilly was not enough. Mouthwatering click........ Dum aloo looks tasty! Aloo dum looks delicious. 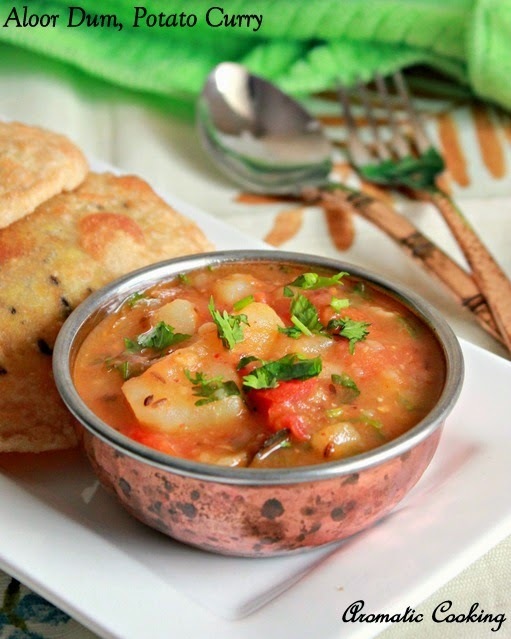 very nice recipe for chapathi. 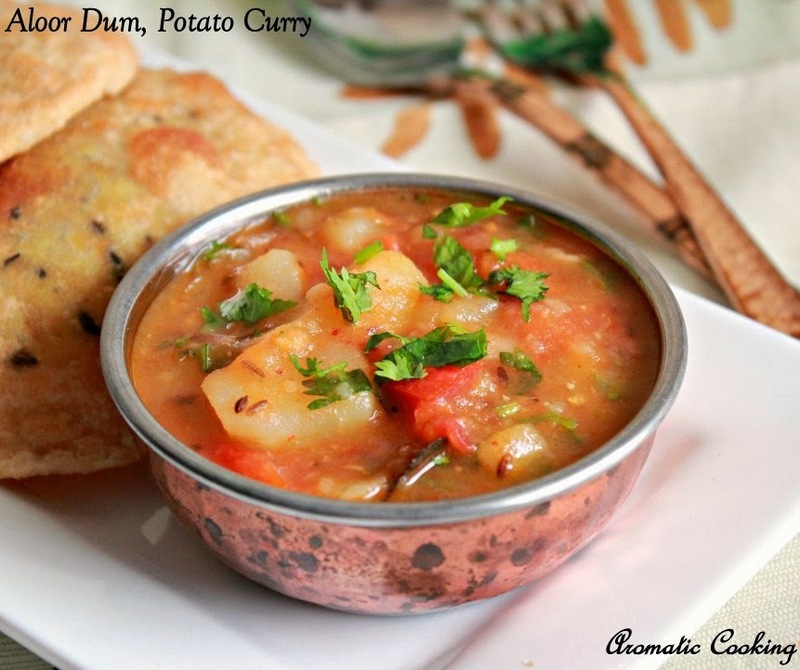 Aloor dum with radhavallabhi thats sounds a prefect pair..
Curry looks delicious, would love with roti or poori..